The dynamic behavior of microtubules (MTs) is essential to their functions and a large number of cellular factors regulate it during the cell cycle. We aim to define the structural basis of dynamic instability, the essential process that, fueled by GTP hydrolysis, leads to switching between MT growth and depolymerization, and that is inhibited by chemotherapeutics like taxol. 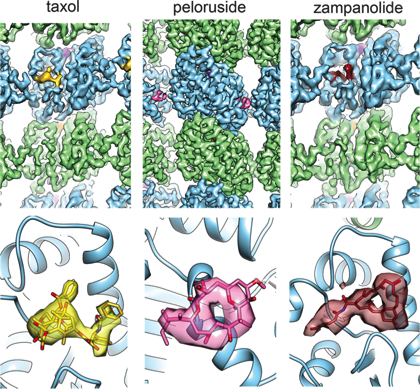 Our original studies of tubulin bound to taxol in polymerized, straight protofilaments, obtained by electron crystallography established the structural basis of nucleotide exchange and polymerization-coupled hydrolysis. Our lab later obtained two structures proposed to mimic intermediates in the assembly and disassembly of microtubules that illustrate the conformational consequences of the nucleotide state and how they relate to longitudinal and lateral assembly. In the last few years our studies have centered on defining the conformational changes within the microtubule upon GTP hydrolysis. Although cryo-EM is ideal to study MTs, structures had been limited until recently to ~8-10 Å resolution. Through the optimization of data collection and image processing, we produced structures at ~5 Å resolution for three MT states: stable MTs bound to GMPCPP, dynamic MT (where GTP has been hydrolyzed to GDP), and MTs stabilized by taxol. 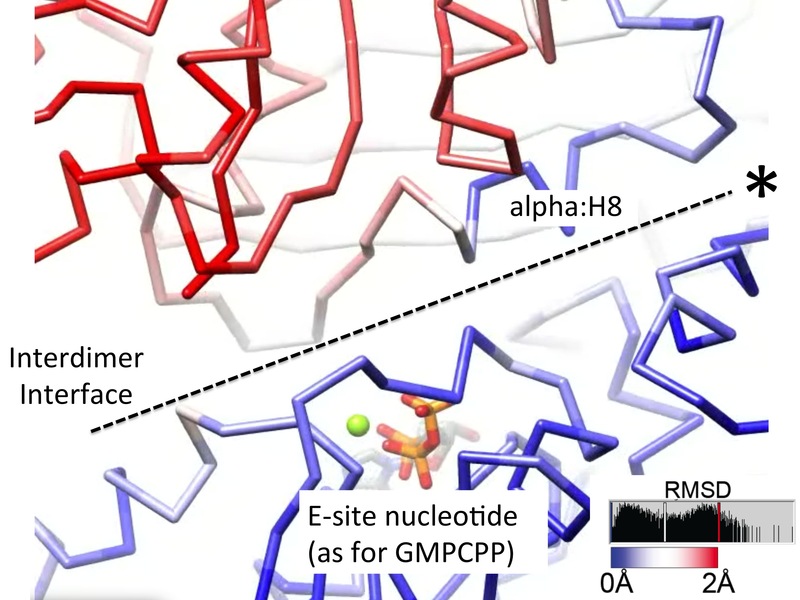 At the time, we used Rosetta to generate low energy ensembles to fit each MT map and ultimately generated consensus models that could be compared to define the changes with nucleotide state and taxol binding Our studies showed that GTP hydrolysis results in a compaction at the interdimer longitudinal interface that buries the E-site nucleotide and a conformational change in alpha tubulin that generates strain in the MT lattice. More recently, utilizing our K2 direct electron detector, we have obtained six cryo-EM structures at ~3.5 Å resolution of MTs bound to GMPCPP, GTPγS, or GDP, either decorated with kinesin or copolymerized with the +TIP protein EB3 (see below). This resolution has allowed us to derive atomic models directly from the density maps and to shed unique light on several key aspects of MT structure and dynamics. Our studies have shown that through the GTP hydrolysis cycle, subtle changes around the E-site nucleotide trigger conformational changes in in accumulation site. The structures also revealed, for the first time, the atomic details of the native lateral contacts between protofilaments, and showed that they do not change with GTP hydrolysis. Reconstructions without any symmetry applied (and reaching 3.9-4.4 Å resolution), allowed us the detailed visualization of the seam naturally present in the MT lattice. We found that the relative position of the two PFs at the seam makes this region of the MT deviate from the cylindrical geometry observed for the rest of the tube. This deviation is more significant for less stable MTs (i.e. GDP versus GMPCPP), suggesting that the seam may be a weak point in the MT lattice that could play an important role in MT disassembly. <!-img style="float: left; margin: 16px 0px 16px 16px; border: #000 solid 0px" src="images/microtubules-EB3-MT.jpg" width="512" height="256" alt="TFIID"--> To allow rapid remodeling of the MT cytoskeleton in response to cellular signals, many MT-associated proteins (MAPs) are capable of modulating MT dynamics. Among them are end-binding (EB) proteins that serve as the central hub for a network of plus-end tracking proteins (+TIPs) that selectively accumulate at growing MT ends and play an important role in modulating MT dynamics. 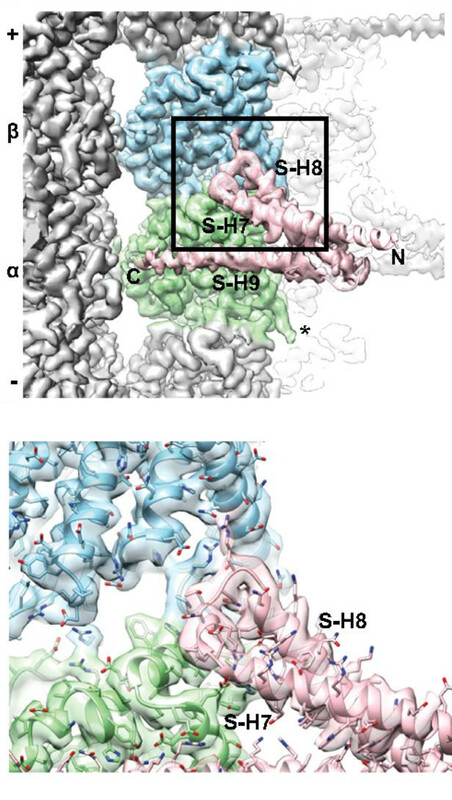 By copolymerization with excess human EB3, we determined the structures of EB3 bound to its preferred substrate, GTPγS-MT at 3.3 Å, allowing us a very detailed description of the interactions between the CH domain and the four tubulin molecules it contacts. 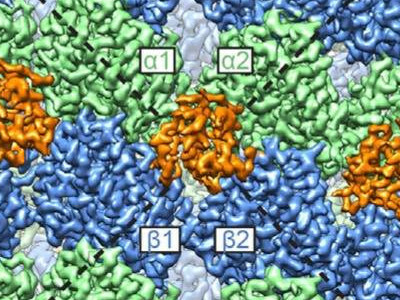 A major finding was that this EB3-bound GTPγS-MT has a compact lattice, similar to the GDP-MT. These results, and our observation that EB3 promotes GMPCPP hydrolysis, has lead us to propose that EB proteins modulate structural transitions at the growing MT ends by recognizing and promoting an intermediate state in the GTP hydrolysis cycle. With the pipeline for microtubule structure determination optimized, we are now embarked in a number of studies that will describe the interaction of MTs with many MAPs that regulate their assembly and dynamics or organize them within the cell. For example, we have visualized, at near-atomic resolution, the interaction of the microtubule cross-linker PRC1 with the microtubule. We have identified the residues in the spectrin domain of PRC1 contacting the microtubule, which interact with the same pocket recognized by kinesin. The angle of the spectrin domain on the MT surface corresponds to the previously observed cross-bridge angle between MTs cross-linked by full length, dimeric PRC1. This finding, together with molecular dynamic simulations describing the intrinsic flexibility of PRC1, suggests that the MT-spectrin domain interface determines the geometry of the MT arrays crosslinked by PRC1. A number of MT-stabilizing agents have demonstrated or predicted potential as anticancer agents, but a detailed structural basis for their mechanism of action is still lacking. We have obtained high-resolution (3.9 - 4.3 Å) cryo-EM reconstructions of MTs stabilized by the taxane-site binders taxol and zampanolide, and by peloruside, which targets a distinct, non-taxoid pocket on -tubulin. 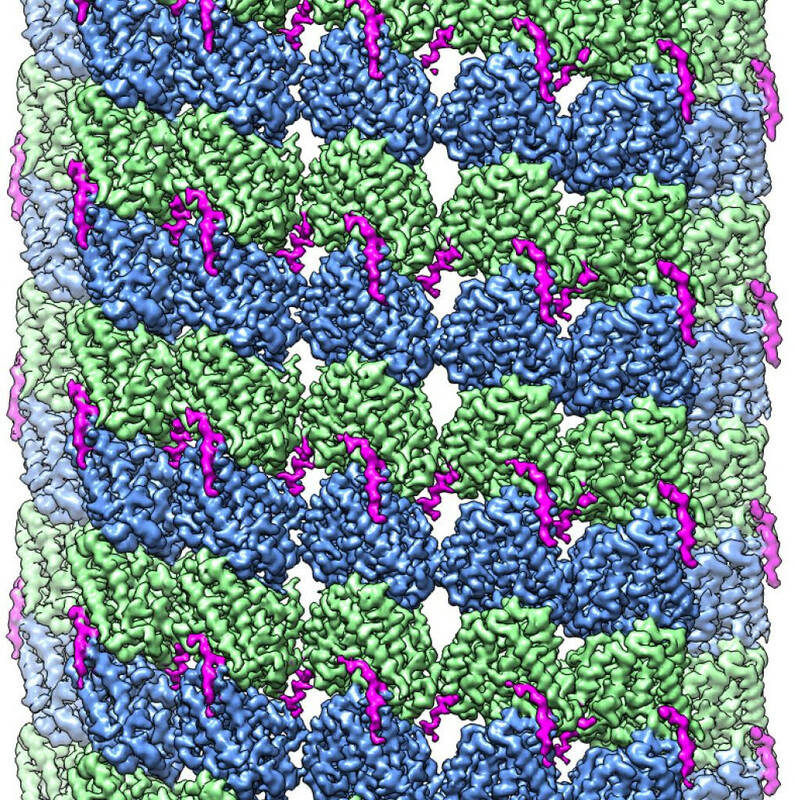 We find that each molecule has uniquely distinct structural effects on the microtubule lattice. Peloruside acts primarily at lateral contacts and has an effect on the “seam” of heterologous interactions, enforcing a conformation more similar to that of homologous (i.e. non-seam) contacts by which it regularizes the microtubule lattice. In contrast, binding of both taxol or zampanolide induces microtubule heterogeneity, while each of these drugs affects the longitudinal interface differently. In doubly-bound MTs, peloruside overrides the heterogeneity induced by taxol-binding. Our structural analysis illustrates distinct mechanisms of these drugs for stabilizing the microtubule lattice, and is of relevance to the possible use of combinations of MT-stabilizing agents to regulate microtubules activity and improve therapeutic potential. We are now interested in the study of cellular factors that, by interacting with the dynamic ends of microtubules, are able to modify the behavior of these polymers. Eva Nogales, Sharon G. Wolf, Kenneth H. Downing. Structure of the αβ-tubulin dimer by electron crystallography. Nature. 391, 199-203, 1998. Eva Nogales, Kenneth H. Downing, Linda A Amos, Jan Löwe. Tubulin and FtsZ form a distinct family of GTPases. Nat Struct Biol. 6, 451-8, 1998. Eva Nogales, M Whittaker, RA Milligan, Kenneth H. Downing. 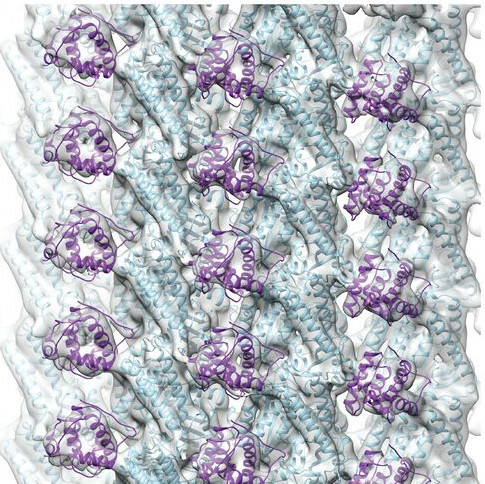 High-resolution model of the microtubule. Cell. 96(1), 79-88, 1999. J. Löwe, H. Li, K.H. Downing, E. Nogales. (2001) Refined Structure of αβ-Tubulin at 3.5 Å Resolution. J Mol Biol. 313, 1045-1057. Hong-Wei Wang and Eva Nogales. The nucleotide-dependent bending flexibility of tubulin regulates microtubule assembly. (2005) Nature. 435, 911-915. 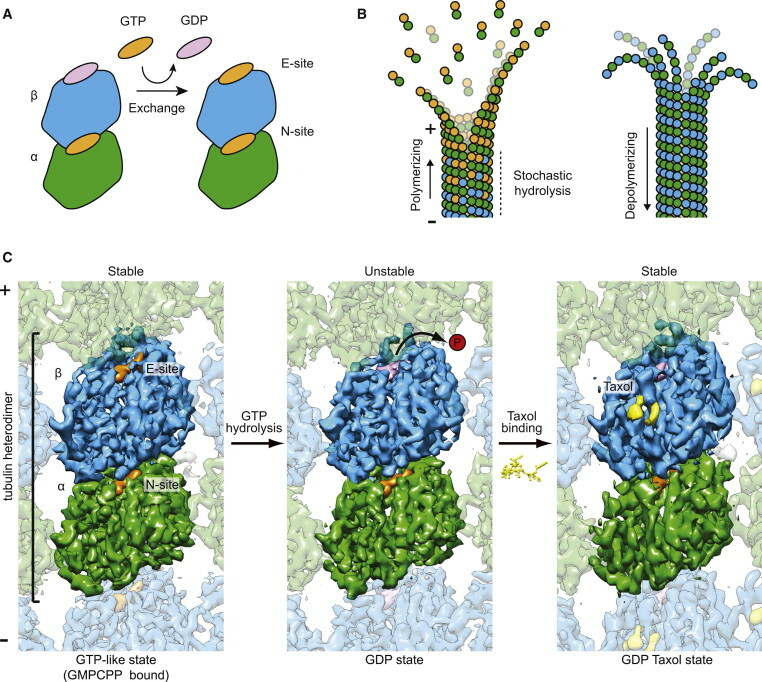 Gregory M. Alushin, Gabriel C. Lander, Elizabeth H. Kellogg, Rui Zhang, David Baker, and Eva Nogales (2014) High resolution microtubule structures reveal the structural transitions in αβ–tubulin upon GTP hydrolysis Cell, 157(5)1117-29.